70 • March 2018 • S I G N & D I G I T A L G R A P H I C S ARCHITECTURAL AND ENVIRONMENTAL Monument Designs with Mechanical Options Preparing a sign for expansion down the line Since 1985, Matt Charboneau has owned and operated Charboneau Design and Consulting in Davenport, Iowa. He is a con- sultant and designer for monument, chan- nel letter and pylon sign projects. His book, "The Pre-Sale Sign Survey Field Guide -- The how-to guide on sign surveys for the profes- sional sign salesperson" can be ordered on his website: www.CharboneauSigns.com or by emailing him at Matt@ CharboneauSigns.com. B Y M A T T C H A R B O N E A U Designing Award-Winning Signs Monument Sign: Single face sign design Height: 24' Width: 16' – 20' (TBD) Top Cabinet: Internally illuminated, aluminum face with routed and backed acrylic graphics. Base: Complimentary with an option for an EMC to be added at a later date. External Illumination: Flood light at base of sign for added dramatic effect. Building Construction: Dark red brick with white trim, white columns, white bell tower. Start With The Top Cabinet Looking at the church's logo, I would start at the top of the sign with the face cabinet. By starting here, you can build the shape of the face in such a way as to compliment the layout of the logo. In this case, the logo takes up a horizontal visible opening, so let's make the face fit the logo shape. Next, I would look at the base or body cabinet of the sign. For the future, there needs to be a place to house a large EMC in the base of this 24' tall x 20' wide sign, but you don't want the monument to have a huge empty cabinet sitting directly under the top cabinet. You decide to create two options for this project. One option will allow for the big sign cabinet to be fabricated as a shorter monument sign that's only 15' tall. (Image A) The second option is to build the sign full size, as if the EMC was in place. To avoid the large bare area below the top cabinet, you cre- ate an option that features back-lit flex face panels that can be decorated with a translucent digital print and swapped out as the seasons and events change. 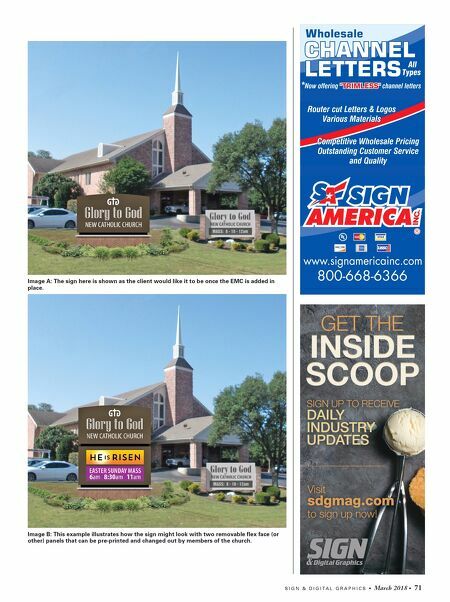 (Image B) It would provide the church some options for advertising until the funds are raised for the EMC. (FYI… for this article, leasing the sign was not an option) Remembering how you planned ahead with the coffee prep from this morning, you realize that this is where the internal structure and foundation supports of this monument sign must be designed to hold up the sign when it's completed and the EMC is in place. So, the question is, how is this done? Planning for the Future Regardless of which option is chosen, the foundation work and the support pipe would be designed and engineered in exactly the same way to accommodate both sign options. I t's Wednesday morning; it's very early, still dark and bitter cold outside. At the first stop sign of your morning commute you spill your entire mug of coffee on the floor of the car. How nice, what a great start to your day. You get to work, park your car and fumble for your keys to unlock the heavy metal fire proof door that's located on the shop side of the building. As the door swings open your senses are immediately overwhelmed by a very recognizable odor; it's a smell you know very well, and it seems to be very out of place at the moment. Suddenly, that strong odor turns on a light bulb in your head and you instantly realize what it is and why you're smelling it! Thanks to your pre-planning the night before, you took the time to actually read the directions on how to set the auto- brew feature on the new coffee machine they installed in the break room. Yeah baby, you now have fresh, hot coffee ready and waiting for that mobile travel mug you emptied out on the floor of your car. You hang up your coat, refill your mug and sit down at your design station where you begin to review a new design request you received the day before. It's a monument sign request for a new church in town but this one's got a unique twist to it. This project will give you the opportunity to be not only visually creative, but mechanically creative as well. What's unique about this job is that right now they cannot afford the sign they really need, at least not for a few years. 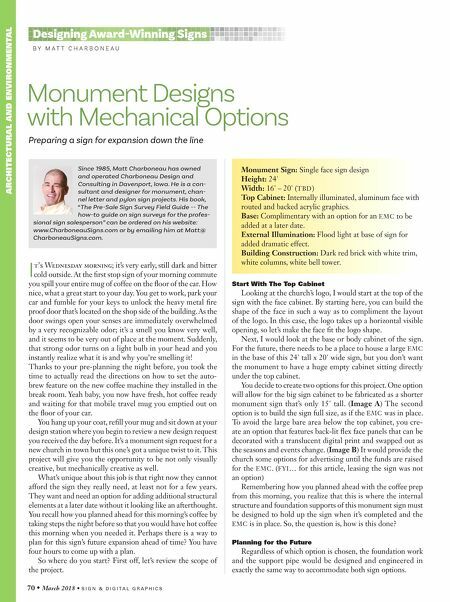 They want and need an option for adding additional structural elements at a later date without it looking like an afterthought. You recall how you planned ahead for this morning's coffee by taking steps the night before so that you would have hot coffee this morning when you needed it. Perhaps there is a way to plan for this sign's future expansion ahead of time? You have four hours to come up with a plan. So where do you start? First off, let's review the scope of the project.